The Mutant Epoch:: HUh? RPGs? What are they? Unfamiliar with tabletop role playing games? Not to worry, as there is an extensive body of literature on the subject just a mouse click away on the internet. See links below for a few that we recommend. In short, role playing games (RPGs) are just as the name implies; players take on roles in a game. Frankly, in this authors opinion, and depending on your group’s style of play, an RPG can be more like a novel or a movie than a game, and be akin to cooperative storytelling with random, unknown ‘scenes’ and outcomes occurring which make it very immersive. There is also no guarantee that the heroes will succeed at their mission or even survive the adventure, which makes for some very gritty, compelling and occasionally nerve wracking sessions. Another aspect of most role-playing games is the fact that instead of competing with the other players sitting around the table, you are normally on the same side and working together to accomplish some sort of quest, with the game master (GM) or referee usually serving as the primary narrator and creator of the setting and all events, beings, and circumstances outside of each player’s characters (PCs) control. In The Mutant Epoch, which leans more towards being a traditional RPG, the players are encouraged to share the narrative on a limited scale, such as controlling specific NPCs on behalf of the GM for example, especially if their own character is not in the current scene where play is currently taking place. For the most part, a tabletop RPG involves a group of players sitting around a table, with between 2 and 4 players and one game master the norm, however one GM and one player is common, while true solo play gaming is also more wide spread than most gamers admit to. Many gamers are busy with work and family, or they are separated from their regular gaming group and still like to tabletop RPG. 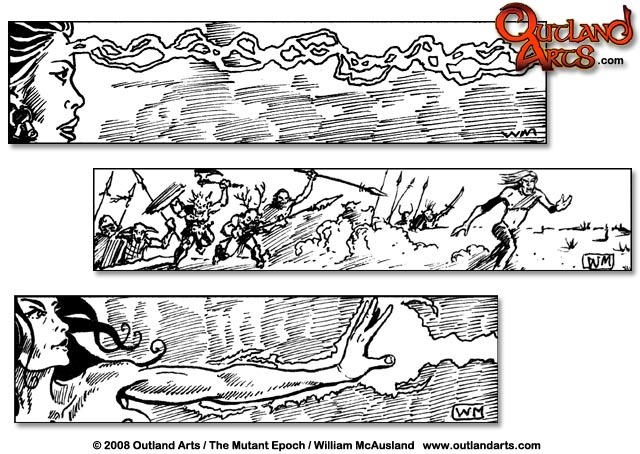 The Multi-path adventures published by Outland Arts, such as Blood Road or Nuke Tower to name only two, are designed for both group play or solo play as there are many options and possible outcomes while playing these adventures. There are many sorts of RPGs from the old school traditional to the ‘hippy’ story games style. Traditional games tend to grant all event, setting and non-player character control solely to the game master and can lead to a hack and slash style play where players tend to avoid character to character or character to non-player character dialogue. Traditional games can lead to something called ‘railroading’, whereby the GM has a set list of encounters and treasure, events and NPCs for the players to meet and tries to coax or force the game session flow down one track, like a railroad. Killing monsters and taking their stuff can be enjoyable and a good way to release steam, however a first person shooter computer game can handle this just as well. Story games, at the opposite end, tend to be focused more on interaction with NPCs and fellow player characters, instead of outright killing them, plus, in many of these games the players either share some degree of story narrative with the game master, or there is no GM at all. For many new gamers, the idea of having to dive into a theatrical role is intimidating and they might find it easier to roll-play at first instead of role-play. If a group of players are experienced gamers, or actors, they can easily tackle a story game, or even turn an old school game into a story game without even tweaking the rules. For beginning players, however the concepts of cooperative play, understanding the game setting, rules and lingo, and differentiating the various polyhedron dice is usually enough for the first couple of sessions and so allowing the players to 'test drive' their characters in the game world and rules mechanics should suffice. In the Mutant Epoch RPG, it is up to the GM and players how much narrative control, NPC assignment, and interaction with NPCs to employ. A person new to RPGs might be wholly freaked out and never shows up at another session to sit at a table where the huge career gamer with a goatee is fully immersed in his role as a petite, elf princess and speaking in a shrill voice whenever uttering the PCs flowery dialogue. In short, there is a dial setting to each game and each gamer, a dial which can be adjusted to accommodate the players and game master to regulate how much character dialogue and play acting is appropriate. Often times somebody playing with those he or she has gamed with for many sessions will relax and get into character more readily, and allow a campaign to switch over to something resembling a novel instead of a mere dice game. It is just something that takes time, allowing the new gamer to feel comfortable at his or her own pace and get over ones innate, culturally imposed sense of feeling silly at playing make belief, let alone talking as his or her character in the 27th century as a cyborg, mutant or synthetic human. In closing, role-playing games are among the most creative, immersive, socially beneficial, imaginative, and affordable entertainment mediums ever devised. All you really need is a rules game book, some paper, polyhedron dice (or a digital dice roller on a laptop), pencils, a couple of friends or family members and your imagination to set out on a most remarkable adventure.